Colourful breeches with a glitter silicone logo, perfect breeches for the younger rider. 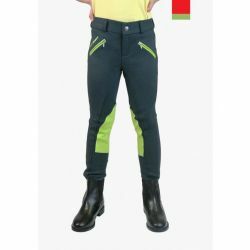 The colourful breeches are made using a cotton and Lycra blend for a comfortable feel, and there is glitter Silicone logo on the front and a star on the rear pocket, making them perfect for younger riders! 95% cotton and 5% Lycra blend, contrast zip pockets, glitter silicone Whitaker to the front, glitter silicone star to the rear, contrast knee patches and Lycra ankes.